East Avenue Road Narrowing Public Meeting. 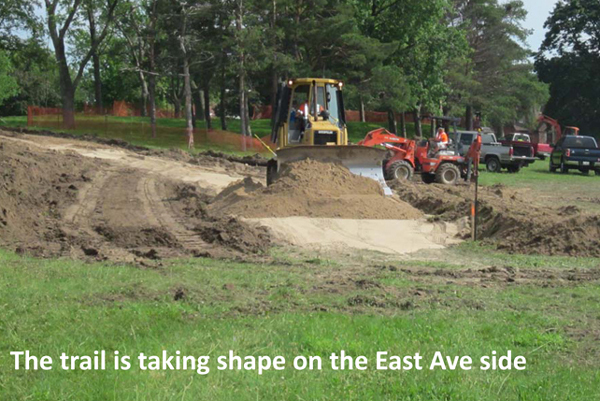 Proposed changes and alternatives will be discussed by the City about East Avenue. Regrettably, we advise that again two cars were looted in the past days in the neighbourhood. The first was near to Simeon and Krug and the other was near to the corner of Simeon and Pandora. An empty computer bag was taken from one of them. Call their non emergency line at 519-650-8500 and report the crime. Thank you to those who have passed along this information to the ANA in such a timely manner. Together with the City of Kitchener, we want to celebrate the centennial of this extraordinary community with the revitalization of Knollwood Park. The plan will turn our park into a harmonious greenspace that invites neighbours to spend Time outside together to meet, talk, play, eat and enjoy, thus strenghtening bonds between individuals and groups which characterize the cohesion and vitality of this community. The City of Kitchener has allocated close to $100,000 to a Knollwood Park Revitalization! Work started in July 2013 to build a new trail system with benches and new trees, upgrade the playground and modernize the sports fields. The ANA is committed to a fundraising campaign to build a pavilion in the park. In conjunction with the Park makeover, the Auditorium Neighbourhood Association is fundraising to build a Community Pavilion where neighbours can meet, kids can take shelter from a storm during play and our seniors can find shade on a walk. The City of Kitchener is working with us to help us achieve our goal. It will provide tax receipts for your generous donations. We are excited that the generousity of our community members beats all our expectations. At halftime we are approaching 80% of our target. The Kitchener Rangers ($25,000) are so far the biggest contributor, but we also raised $ 10,000 from neighbours. Some families have made very generous donations, but there are allso dozens of small donations which we value all the same. 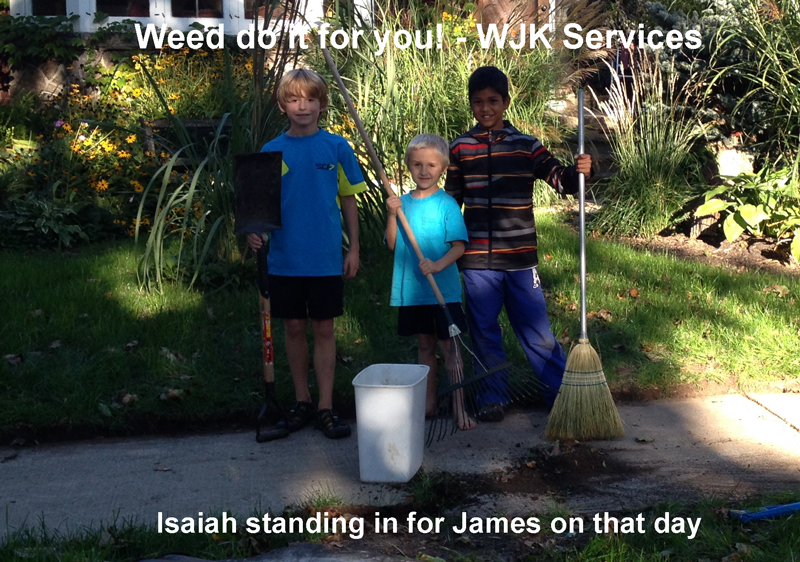 Our favourite story so far is that of the Lompart boys Wes and Kegan plus James Sweeney who have worked all summer edging front yards in the hood and donated 50% of their income to the campaign! Well done and special thanks to the boys. Now we need you to help us cross the finish line—Consider making this YOUR CHOICE FOR DONATIONS in 2013! The ANA has pledged existing funds of $13,000, including a Grant from the Festival of Neighbourhoods. The Kitchener Rangers have contributed $25,000. We aim to raise $20,000 from the community of neighbours and businesses. 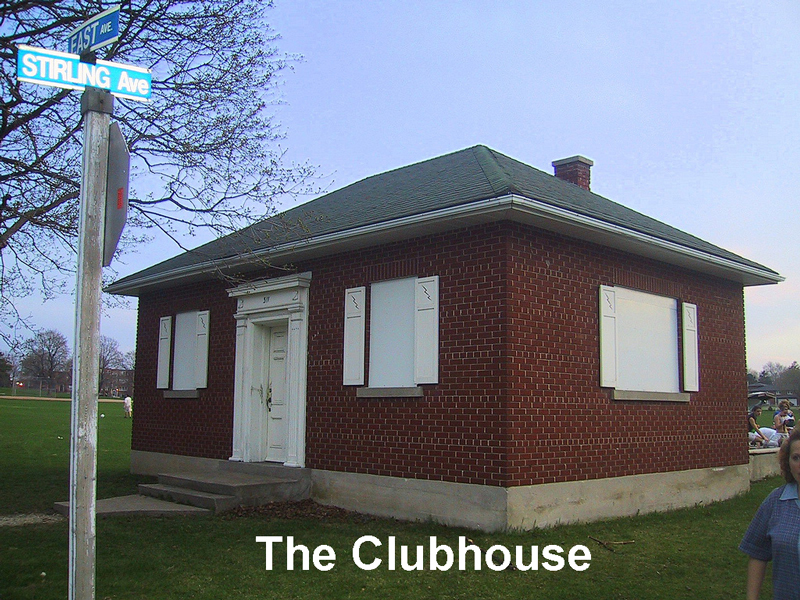 Follwing the demolition of the old Hydro Substation (aka The Clubhouse ) in Knollwood Park at the corner of Stirling and East Avenues the ANA lobbied with the City of Kitchener to direct some attention and funding to our community park which had been largly neglected for approx. 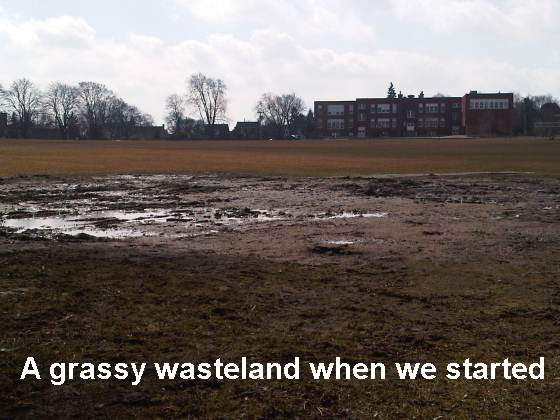 40 years and had become a mere grassy wasteland. With the support of our Councillor Dan Glenn-Graham we had an initial round-table meeting between the ANA board and City of Kitchener representatives in spring 2012 in which we agreed that the Dept. of Park Development under Glen Hummel would take a park revitalisation proposal the City Council the next year. With this committment, The City and the ANA invited the East Village community to a park-walkabout to collect ideas and identify problems. City Landscape Architect Mark Parris and our District Community Services Facilitator Abbie Grafstein compiled a list of all ideas which was shared with the community. On Sept. 10, 2012, the Auditorium Neighbourhood Association, in partnership with the City of Kitchener, presented a series of conceptual plans designed to improve the existing open space. Based on input received from the community, a preferred concept plan was generated reflecting the consensus of priorities of the community. 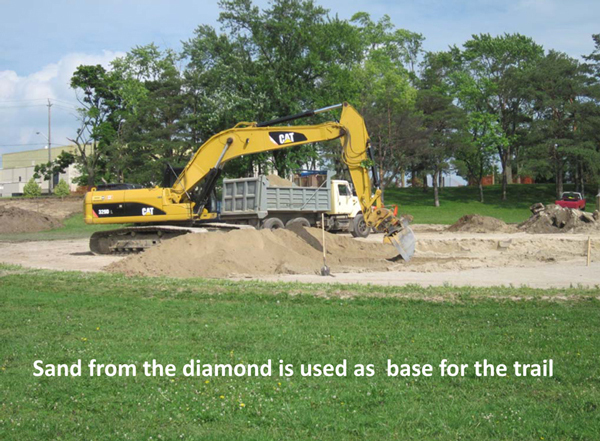 In January 2013, the City of Kitchener allocated $100,000 to the Knollwood Park Revitalization. 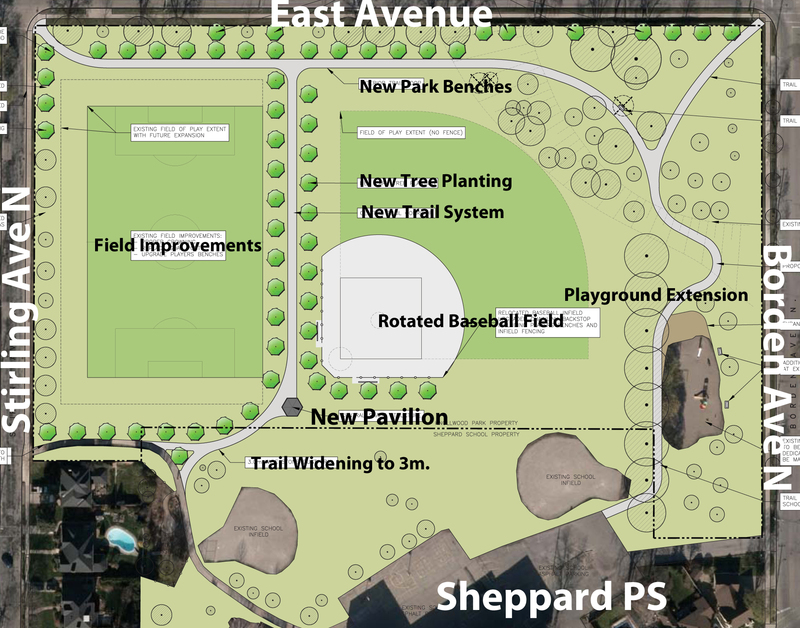 A new trail and a playground extension have since been completed; a modernization of the sportsfields, a berm along East Ave. and the allocation of new trees and benches are in progress. In conjunction with the Park makeover, we are fundraising to build a pavilion where neighbours can meet, kids can take shelter from a storm during play and our seniors can find shade on a walk. The City of Kitchener is working with us to help us achieve our goal and will provide tax receipts for your generous donations. I’ve been helping the Auditorium Neighbourhood Association deal with the issue of Auditorium parking especially in relation to the latest expansion. My involvement included presenting to City Council on behalf of the ANA its response to the plan for parking and transportation to the expanded Aud. Rangers Express – I’m told an impressive 11,500 people last year rode a special bus from area restaurants to and from the Auditorium. This year there are 10 participating locations including one in New Hamburg. This program has been a huge success and much quicker than I anticipated. (Rangers games only). Free GRT rides – The free bus ride program started last October is back and in place for the first game. Tickets are available at the Aud’s box office. Car pool – The car pool lot was an instant success last year. But even the lot is full, car pooling is still a great way to get to the Auditorium. Reserved Paid parking – Season’s passes for preferred parking are available from the Rangers. Free parking – The Auditorium has several large free parking lots but when the building is at capacity you need to arrive early if you want a space and avoid searching for a space on local residential streets–possibly risking a parking infraction. Thirty-five new spaces have been identified off site. These efforts are starting to add up. With 968 seats added last year that meant potentially 372 more vehicles using stats from a parking study. The good news is that there are not that many new vehicles. 11,500 rides on the Rangers Express for 34 home games and 5 playoff games is an average of 295 per game. Divided by the consultant’s finding of 2.3 people per vehicle, that saves 128 spots per game. The car pool lot reduced parking needs by at least 92 spots. On site parking for fans has increased by 35 spots due to the use by staff of off site parking. The free GRT rides were considered successful but it’s not clear how many were used. So the new parking and transportation options mean that 255 or more vehicles have been diverted from parking on residential streets. The city and the Rangers have delivered what they promised. Congratulations to the both organizations for that significant achievement. It required a concerted effort and plenty of work. Let’s take it over the top! I had hoped to see more changes this year so that we’d be back at 2012 demand for on street parking–and ideally reduce it further. More dedicated car pool parking spaces with an increase in the minimum occupancy from 3 to 4. Have paid parking on all the onsite lots for a modest $5 or $10 (with funds split between charities and subsidizing/promoting transportation alternatives). Instead of having car pool lots, let vehicles with 4 or more people park for free. Make it easier for people to use the free GRT rides for fans who attend the occasional game. A combination of these ideas could mean fewer vehicles looking for parking than before the expansion. Big changes are coming to the Frederick Street on and off ramps to the Conestoga expressway which are frequently used by Auditorium Neighbourhood Association residents. The changes are a result of the new highway 7 which like it or not, the new highway 7 route appears to be a sure thing. Victoria Street will no longer be part of highway 7 when the new route is built. Instead the new highway will connect to the expressway near Wellington Street where it currently ends near Riverbend Drive and Shirley Avenue. If you heard that the current Frederick Street ramps will all be closed or just those on one side, you’ll be happy to learn that neither is happening. Two ramps are disappearing (one for either direction) but there are some other changes planned that compensate for them. The plans also include two new “connection” roads from where Edna ends at Victoria over to Wellington and from where Bruce ends at Victoria over to Wellington. Those connection roads are essentially extensions of Edna and Bruce. They mean that the “lost” ramps are replaced by ones at Wellington that you should find relatively accessible. The Ministry of Transportation confirms that there will be two-way traffic on both of these “connection” roads. 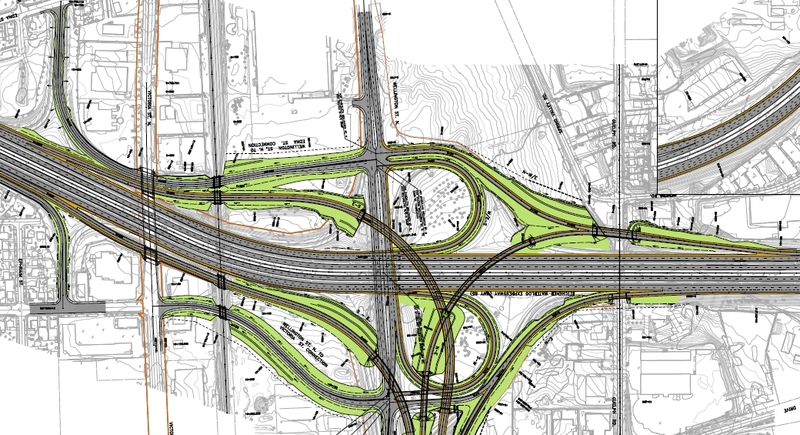 That fact means the ramps on Wellington Street are conveniently only a short drive away and essentially respects existing patterns for getting on and off the Conestoga Expressway. You can find a detailed map. So it appears to be a best case scenario for the changes to our expressway access but we’ll want to monitor the situation—especially for impact to our neighbourhood. The City has recently completed its transportation master plan and took the new highway 7 into account. It doesn’t expect any need to change Lancaster Street between Victoria and Krug. Time will tell. The Region is updating its transportation master plan in part to account for the new highway 7. What is decided could affect our streets so we’ll want to take advantage for opportunities to review the updated plans and give impact.